Now, I’ll warn you, it does take a while to make, especially if you’re going to cook your own beans. It’s worth it, trust me. We made this over the course of the afternoon after returning from our walk and the thick, hearty chili was just right for a cold and snowy evening. While I do show this in its chunky, fresh from the pot state, we both found that we preferred it after pureeing for a few seconds. It was smoother and more to our taste – however, I know that many chilis are very chunky, so puree or not as you like. Cut peppers in half and remove seeds, stems and membranes. Place skin-side up on a foil-lined baking sheet and broil until blackened – about 12 minutes. Place in a paper bag and let stand for 10 minutes. Peel away the blackened skin and chop finely. Heat oil in a large pot over low to moderate heat. Add onion and cook for 10 minutes until nicely browned. Stir in cumin, crushed chili flakes, paprika(s), a pinch of salt and garlic, plus a splash of white wine, then cook for 2 minutes. Add peppers, broth, squash and tomatoes, bring to a simmer and cook, stirring occasionally, for about 20 minutes. Add cooked beans and continue simmering for an additional 25 minutes. Puree about a third to a half of the chili using an immersion blender or blender/processor to make it thick and tasty. Serve with sour cream. 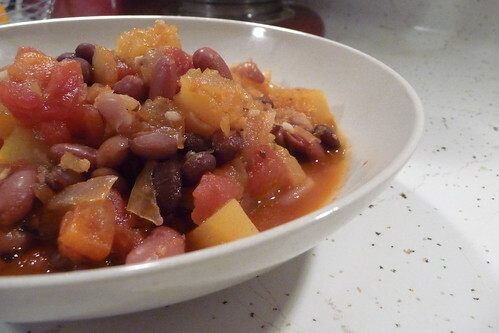 Obviously you can use whatever mixture of dried beans you like. Or, you can use canned – the ratio is 1/2 cup dried beans (makes approximately 1 1/2 cups cooked) to 1 15oz can of drained, canned beans. Or, you can use about 4 canned roasted red peppers. Sometimes red bells are just too expensive to buy here, so I always have some canned on hand. In this case, I used acorn, but you could use butternut, delicata, hubbard or even pumpkin. Or just about any other winter squash I’ve forgotten to name here, except maybe spaghetti squash. That I don’t think would work. I use the overnight soaking method, but you can also do a “quick soak.” I don’t like it because it’s more work and takes just as long as the overnight soaking method! It’s really only useful when you forget the put the beans in a jar the night before. Adaptēts no 2010. gada, Janvāra “Cooking Light” žurnāla. Sālsūdenī vāri mērcētas pupiņas līdz tās ir mīkstas (apmēram 2 stundas). Pārgriez piparus uz pusēm un izņem sēklas. Ar griezuma pusi uz leju liec cepešplātē (lai atvieglotu mazgāšanu cepešplātē vari ieklāt alumīnija foliju) un 10 – 12 minūtes cep 250° temperatūrā, apmēram 15 cm no cepeškrāsns augšas, līdz miziņa kļūst melna. Ievieto papīra maisiņā vai slēgta traukā un 10 minūtes ļauj atdzist. Nomizo un smalki sagriez. Uz lēnas uguns, apmēram 5 litru lielā katlā, uzkarsē eļļu. Katlā cep sīpolus līdz brūni, apmēram 10 minūtes. Pievieno ķimeņu pulveri, paprikas pārslas un pulveri, sāli, ķiplokus un vīnu, karsē 2 minūtes. Kopā ar pipariem, buljonu, ķirbi un tomātiem sautē 20 minūtes. Pievieno vārītās pupiņas un turpini sautēt vēl 25 minūtes. Ja sautējumu vēlies viendabīgāku, daļu vari sablendēt. Pasniedz ar, vai bez, skābo krējumu. This entry was posted in american, dairy-free, gluten-free, latviski, mexican, one-dish, recipes, vegan, vegetable, vegetarian. Bookmark the permalink.